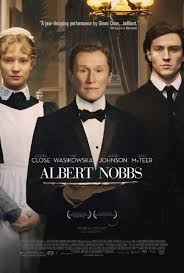 Albert Nobbs (2011) Rated R | What to Watch. Albert Nobbs is actually a woman in late 19th century Ireland, where it is discouraged for women to live independently. She looks for a way to escape the lie she lives. Based on the novella by George Moore. Starring Glenn Close, Antonia Campbell-Hughes, Mia Wasikowska, Brendan Gleeson, Jonathan Rhys Meyers. In a restrained performance, Close plays an independent woman who transforms herself into a man to survive. As Albert Nobbs, she is able to secure employment as a waiter at a prestigious hotel, where she remains under the radar for several years, until she encounters a painter who inspires her to dream of a less lonely existence. An exercise in studied character development, this is a sedate but powerful film. It is worth a watch. This entry was posted in 2011, Based on a novel, Drama, films, Movie reviews, movies, Rated R and tagged 19th Century, Albert Nobbs, Antonia Campbell-Hughes, based on the novella, books, Brendan Gleeson, family, film, film reviews, films, george moore, Glenn Close, Ireland, Jonathan Rhys Meyers, lie, lies, life, live, male, man, mia wasikowska, movie, movie reviews, movies, performance, story, survive, trailer, woman, women, world, worth. Bookmark the permalink. Pingback: St. Patrick Day Films 2016 | What to Watch. Pingback: Jonathan Rhys Meyers | What to Watch.